The TIU- which was set up to police the sport - said it had a zero-tolerance approach to betting-related corruption. Chris Kermode, who heads the Association of Tennis Professionals, rejected claims evidence of match-fixing had "been suppressed for any reason or isn't being thoroughly investigated". But he added: "While the BBC and BuzzFeed reports mainly refer to events from about 10 years ago, we will investigate any new information." 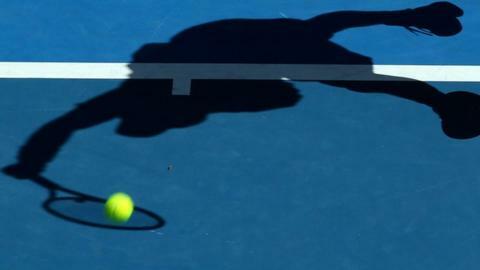 The Tennis Files: Have top players been paid to lose? "As a result, no new investigations into any of the players who were mentioned in the 2008 report were opened," a TIU spokesman said. "There was a core of about 10 players who we believed were the most common perpetrators that were at the root of the problem," he said. "The evidence was really strong," he added. "There appeared to be a really good chance to nip it in the bud and get a strong deterrent out there to root out the main bad apples." However, tennis' integrity unit does have the power to demand all this evidence from any professional tennis player. "There is an element of actually keeping things under wraps," said Benn Gunn, a former police chief constable who conducted a major review of betting in tennis that led to the creation of the Tennis Integrity Unit. It's the first time he has publicly spoken about his concerns. "If they were really serious about dealing with this, then they really need to create an integrity unit with teeth," he said. While he welcomed the support of the betting industry, Nigel Willerton, director of the TIU, said "it is not the role of betting companies to make judgements about corrupt activity". He added: "All credible information received by the TIU is analysed, assessed, and investigated by highly experienced former law-enforcement investigators." "The TIU has a full-time staff of just five and relies on intelligence from players and betting companies to alert them to potential corruption. They have a presence at between 20 and 30 tournaments a year, and their investigations over the past two years have resulted in seven players and one official being banned for between six months and a lifetime. "Only one of those players has ever reached the top 200, and there are clearly temptations for lower-ranked professionals. Players outside the top 200 are unlikely to earn much more than £40,000 in prize money each year, and that is before coaching, travel and hotel expenses are taken into account. "It is highly debatable whether enough resources are directed towards the TIU, and another potential flaw is that representatives from the sport's four governing bodies decide whether the evidence gathered is strong enough to be presented to an independent hearing. Professional Tennis Integrity Officers from the ITF, ATP, WTA and the Grand Slams make that call, and as a result the process is not as transparent as it should be."